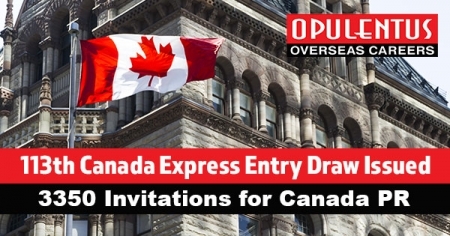 Canadian Government announced 3,350 invitations to appeal for Canadian PR to Express Entry applicants in a draw conducted on Mar 20. The cut-off score of Comprehensive Ranking System in Mar 20 draw was 452, a drop of 02 points over the least score in the earlier Express Entry draw conducted on Mar 6. Immigration, Refugees and Citizenship Canada (I.R.C.C) has presently announced a sum of 21,200 ITAs (Invitations to Apply) in the year 2019 by the Express Entry system. It is an addition of 6,700 above the 14,500 I.T.As that Canada had announced at this equivalent point in the year 2018 — a year that observed I.R.C.C declared a record number of 89,800 invitations to Express Entry applicants. It is assumed that I.R.C.C will fix the latest ITA record in this year given Canada’s greater 2019 and 2020 admissions goals for the 03 Federal High Skilled categories of economic immigration controlled by the Express Entry system — the Federal Skilled Worker Class, Canadian Experience Class, and Federal Skilled Trades Class. Applicants who satisfy the eligibility criteria for these categories are accessed into the pool of Express Entry and announced a ranking score depends on factors such as their educational background, age, work experience and ability in English or French. I.R.C.C then invites a fixed number of the top scoring applicants to appeal for PR of Canada through routine draws from the pool. The tie-break rule in the Mar 20 draw was introduced at Feb 7, 2019, at 9:59 UTC. It means that all applicants with a Comprehensive Ranking System score of 452 or higher who accessed their profile in the Express Entry pool prior to the selected time and date got an ITA in this round of invitation. Bigger draw sizes can also have an influence on the CRS score cut-offs. Given I.R.C.C’s greater admissions targets for the year 2019 and 2020, it is probable that we will see significant draws in the 2nd quarter of the year. The 2nd quarters of both 2017 and 2018 noticed improving draw sizes and the CRS cut-off decrease as a result.